GOSHEN—It wasn’t Times Square, but it was fairly packed on Goshen’s South Church Street on New Year’s Eve for the village’s first ball drop. 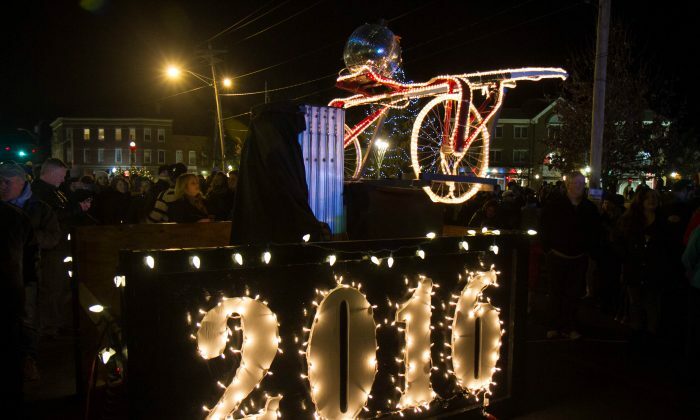 “We really had no expectations for the night since it was the first time we were doing it so we are really overwhelmed and overjoyed with the turnout tonight,” said Illuminate Goshen President, Molly O’Donnell. Goshen Mayor Kyle Roddey estimated they had over 3,000 people “easy” in the course of the night. Part of the draw could have been curiosity. Up until Dec. 31 the design for the ball and the actual drop was kept mum, but Roddey hinted it was not going to be a repeat of New York City’s. “It’s something more in line with Goshen’s background,” he said earlier in the week. Indeed, the disco-looking ball itself seemed less the focus than the lighted sulky that was carrying it. Given the fame of Goshen’s historic racetrack and its history of harness racing, the sulky should have come as no surprise. The design was done by Orange-Ulster BOCES students under the direction of Daniel Wright, a village resident. Another Goshen resident, Dominick Igneri helped with the lift, and the county provided the stage for the event “It was a team effort in every way imaginable,” Roddey said. The night started early with games and activities for kids with a count down to the ball being raised for the early-to-bedders.